There used to be a simulator ride at Walt Disney World called “Body Wars.” Riders would sit in hydraulic chairs and face a wide-screen projection that took them on a journey: they would be “shrunk” to microscopic size and injected into a patient’s body. Their mission? To diagnose and treat a flesh wound. It might be hard to believe, but the reality is that technology similar to this already exists. We can now literally consume technology and reap the medical benefits. Move over wearables and embeddables, because the mobile wireless health revolution is well underway thanks to smart pill technology, also known as “ingestibles.” According to the report “Smart Pills Technologies Market (2012-2017),” the global smart pills market is expected to reach $965 million by the year 2017. The technology development is currently focused on two primary functions: wireless patient monitoring and diagnostic imaging. Imagine receiving a text message notifying you that your grandmother forgot to take her pill this morning. The technology is within our reach. Ingestion monitoring systems have been approved and tested extensively. 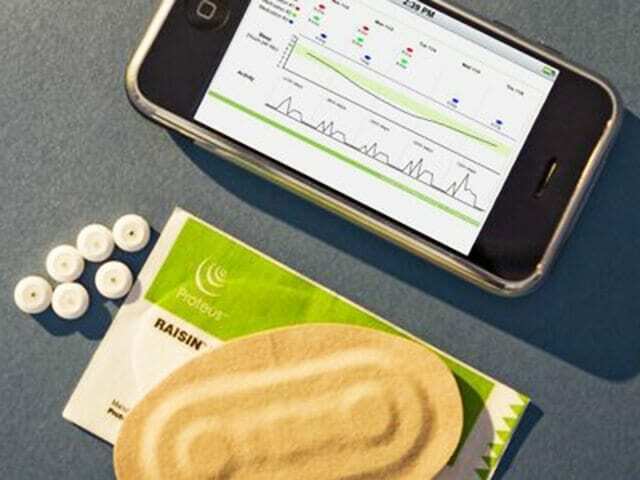 For example, Proteus Digital Health has developed a system consisting of a smartphone, a sensor patch and a pill. Each pill contains a one-square-millimetre sensor that is coated in two digestible metals: copper and magnesium. These metals are not dangerous to consume because they currently exist in multi-vitamin supplements, as well as naturally in our diets. Upon swallowing, the sensor is activated by electrolytes within the body. The pill then transmits a signal to a small, battery-powered patch worn on the user’s torso and sends the data via Bluetooth to a caregiver’s or family member’s smartphone. Systems like Proteus are meant to help tackle recurring problems in the health sector, like patients who forget or choose not to take their prescribed medications. There is also the possibility that patients are taking their medications incorrectly. For example, patients might be combining medications or taking the incorrect dose, which can prove to be very dangerous and damaging to the body. This is a growing concern as more than 50% of senior citizens in Canada take more than five different medications daily. Ingestibles are working to address issues surrounding chronic disease management, eliminating the need for endless physical checkups. Using a similar approach to Proteus, pharmaceutical companies could breathe new life into their innovation efforts. Now imagine swallowing a disposable pill instead of having an invasive colonoscopy procedure. Given Imaging, an Israeli company, has made this possible. The company has developed a battery-powered camera pill that can take high-speed photos of the intestinal tract. The device then sends the images to a second device worn around the patient’s waist and then to a computer or tablet to be reviewed by a doctor. If swallowing a camera makes you feel squeamish, you might be relieved to learn that it has been approved by the United States Food and Drug Administration. The PillCam COLON is intended for patients who have difficulties undergoing standard colonoscopies due to anatomy issues, previous surgery or various colon diseases. This non-invasive test can be used to remotely visualize the gastrointestinal tract and colon to detect polyps and identify the first signs of colorectal cancer. It is estimated that in 2014, more than 24,000 people will be diagnosed with colon cancer (Canadian Cancer Society). The PillCam COLON will allow more people to get screened in an effective and convenient manner, decreasing the economic impact on the health system and increasing the survival rate of those diagnosed. The idea of putting tiny microchips and cameras into the human body might make some consumers uncomfortable. There’s no doubt that numerous scientific, legal and ethical questions will be raised in the next few years. The jury’s still out as questions about privacy, data sharing and side effects continue to be raised. In the meantime, some companies are attempting to bridge the gap and develop products that take a baby step into improving a user’s adherence to their prescription regimen. For example, Adhere Tech has developed a smart pill bottle that lights up, buzzes and sends text and voice messages to remind users of their pre-scheduled dosages. In addition to sending reminders, the bottle also keeps track of the number of pills left and how many times the bottle has been opened and closed. Proteus and Adhere Tech are just two of the many companies competing in the home medical equipment industry. Scientists and researchers are working on even more impressive applications of ingestibles. For example, Scripps Health is currently developing nano-sensors that can travel the bloodstream and send messages to a smartphone, alerting the user of signs of infection, an impending heart attack or other cardiovascular issues. It’s clear that these nano-sensors and other smart pill technologies could absolutely change the game when it comes to wireless health.